Few would suggest the mortgage underwriting process to be aware of all risks presented to it. Risk is a desired feature of any market that drives the basis for margin management. The use of big data in today’s underwriting helps mitigate risks and price for it accordingly. Big data helps businesses to find efficiencies in places they either didn’t think of or couldn’t gain access to previously, giving market leaders the opportunity to move from a hunch to a certainty. The property backing the mortgage has been the poor relation when it comes to the volume of data gathered against it to make a viable mortgage advance assessment. This may not change and the focus we as a property risk software business are being asked to put behind remote valuation software, AVM powered insights and enhanced risk management tools supports concentration on carefully managing resources to physically value what is necessary with quality data. For lenders and surveyors, the whole property underwriting process is about eliminating valuation risk by injecting consistency, accuracy and timeliness into the process. Decisions are more timely and consistent leading to less valuation challenges and post valuation queries when a lender can access better data to make better decisions. Whether flood, subsidence, fraud, title, lease length or valuation data to name a few is required this can be accessed and surfaced swiftly putting the surveyor in control with big data at their disposal. 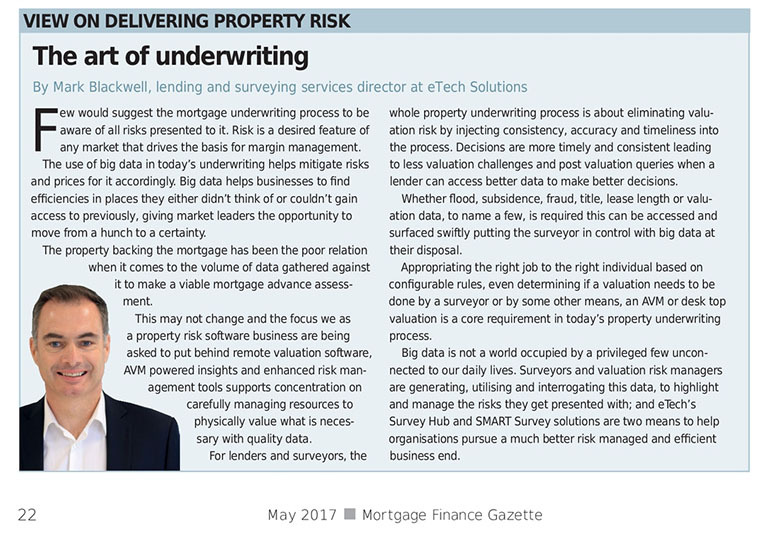 Appropriating the right job to the right individual based on configurable rules, even determining if a valuation needs to be done by a surveyor or by some other means, an AVM or Desk Top valuation is a core requirement in today’s property underwriting process. Big data is not a world occupied by a privileged few unconnected to our daily lives. Surveyors and Valuation risk managers are generating, utilising and interrogating this data, to highlight and manage the risks they get presented with and eTech’s Survey Hub and SMART Survey solutions are two means to help organisations pursue a much better risk managed and efficient business end.